Is it just me? Have you also noticed that commercial rabbit pellets in the wintertime are of mediocre quality at best? Many feed mills list things like ‘forage products,’ so they can put into the feed whatever they can obtain cheaply. Part of the problem, no doubt, is seasonal. In the winter, everything dies. Grasses are brown, temperatures drop and the ground rests until springtime. Rabbits in the wild suffer too. In snowy climates, there’s very little to eat. Bark becomes a main staple that tides them over till spring. To be fair, it might be very difficult for mills to find ingredients reasonably priced. In the meantime, our rabbits lose condition and even get sick. I’ve heard tell recently of enteritis (diarrhea) cropping up here and there. I’m convinced that at least some of this is due to flagging immune systems because of poor feed. Animals can die partially due to poor rabbit feed quality. Supplement daily with hay - both alfalfa and timothy or orchard hay. Offer some fresh greens (organic) - carrots or other green veggies. If you live in California, you might still have dandelions which you could pull and feed. 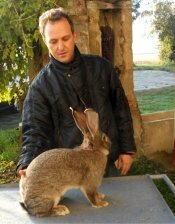 Marco is a breeder of Italian Flemish Giant show rabbits in Italy. His next big show is in Switzerland in mid January 2011. He found our Magic Conditioning Formula and is adapting it to the ingredients available to him in Italy. We hope he wins big! Send us pics of your bunny, your rabbitry, your best show rabbit, or even your worst. Tell us the story of your picture in a few words - we’ll pick the fave and publish it in next month’s Rabbit Rhythm. but not dogs or cats? Dogs and cats are carnivore predators, which are not typically considered a food source, unless the circumstances are utterly dire. Rabbits on the other hand, are the world’s quintessential prey animal. They are chased, caught and consumed by every land-dwelling predator on the planet. Man himself has domesticated and eaten rabbit since the times of the Egyptian pharaohs. Prosperity has distanced us from our food sources. Life is so easy when you can drive to the supermarket and purchase your meat in square styrofoam trays! Please don’t forget that rabbits, despite their cuteness, are still ‘prey’ animals, and there is no ethical prohibition to eating them. There’s just that formidable cuteness to contend with! 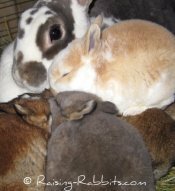 Talk about cuteness, we changed the picture on the Raising-Rabbits home page - have you seen the big new photo?? We snapped a pic of our doe Xena snuggling with her young litter. The little spotted fawn bunny is standing smack dab on top of his littermates, and none of them seems to mind! Bottom line - save you many more dollars than the cost of the e-book! Rabbit rancher and veterinarian, Dr. Myriam Kaplan-Pasternak, was awarded the Presidential Volunteer Service Award in early December 2010 for the volunteer work she is doing in ravaged Haiti. Dr. Kaplan-Pasternak knows rabbits. Her barn is filled with up to 4,000 rabbits, and she supplies the Bay area restaurants with rabbit meat. For the last 4 years through the Farmer to Farmer program, she has been helping Haitian ranchers support themselves through raising rabbits and selling the surplus. Your friends at Raising-Rabbits.com wish you a very Merry Christmas and Happy Holiday Season.